Contracts can be your first line of defense against delays. But they have to be drafted very carefully. Construction Delay Claims gives you an in-depth analysis of all the pertinent clauses, and details what they can and can’t do to minimize delays and avoid litigation. 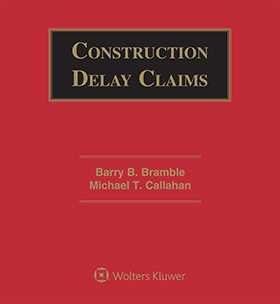 Construction Delay Claims, Sixth Edition, by Barry B. Bramble and Michael T. Callahan, is written for everyone involved with delay and impact construction claims—the most common form of disputes in the construction industry. You’ll find that this resource presents the most thorough, detailed review of delay claims liability available, including a complete description of the entire process for filing and pursuing claims along with numerous cases and analyses. Construction Delay Claims gives you the information you need to determine your best course of action. The book presents detailed knowledge drawn from the authors’ thirty-five years of experience in the industry. You’ll learn how to anticipate delays and mitigate damages through the use of advanced planning and immediate responses by the parties involved. You’ll also receive helpful instructions about the best use of construction schedules to avert delays, or to prove their impact if they do occur. The new American Institute of Architects contract document A201-2017 has been referenced throughout. The Second Edition of the Society of Construction Law’s Delay and Disruption Protocol is discussed. Expanded discussion of the linear scheduling method, including of two types of constraints that many linear schedules use. Explanation of what a surety should do before choosing which method to employ to ensure a project is completed as originally agreed. Discussion of a federal district court case that rejected the total cost methodology of calculating delay costs. Case law references have been updated throughout.